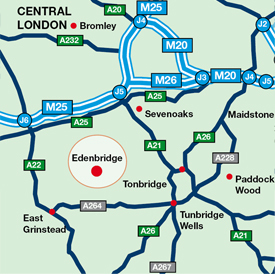 Eden House Business Centre is located in the Kent town of Edenbridge, which is served by two railway stations providing regular services to Oxted and East Croydon with connections to London Victoria and London Bridge. The first thing you notice as you enter Eden House is the impressive entrance lobby providing a meeting point, private and secure mailboxes and a state of the art access control system - all of which create a great first impression for your clients, employees and visitors. If you're looking for self-contained or serviced offices in Kent, visit Eden House to view our full range of facilities and convenient, yet idyllic rural location. We have a range of options and facilities to suit your personal and business needs.